The data in this plots were collected by Florencio Garcia-Santamaria as part of his research on Quantum Dots with the Nanotechnology and Advanced Spectroscopy Team in Los Alamos National Laboratory. The upper panel is the probability distribution of electrons and holes in Quantum Dots with a 1.5nm radius CdSe core and different CdS shells thicknesses. This is a 3 layer graph with different dimension in which each plot was displayed twice, once as a fill area pattern and another for added clarity. The lower-left panel is the overlap function of holes and electrons for CdSe/CdS Quantum Dots with varying core radius and shell thicknesses. This is a 3D matrix surface plot with a projection. The lighting feature was used to enhance the colors. The mesh and contour lines were removed from the surface plot. The color map palette used is rainbow. 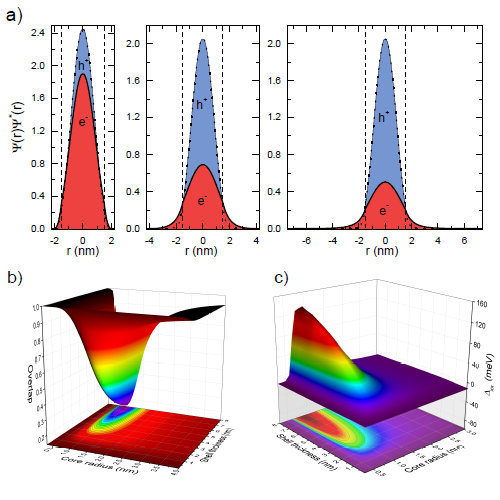 The lower-right panel is energy shift as a consequence of the biexciton interaction in CdSe/CdS Quantum Dots with varying core radius and shell thicknesses, which is plotted similar to b).